Teenage Mutant Ninja Turtles or TMNT are ALL THE RAGE right now! For moms out there that rely on licensed character party supplies to decorate your party space…NO LUCK! There are none out there right now! Seems that Nickelodeon hasn’t quite caught on just yet! Mark my words…give it a few months and TMNT party supplies will be everywhere. But…until then, you have a TMNT party coming up and no party supplies out there…so what do you do? It’s simple…you get creative transforming ordinary items into EXTRAORDINARY PARTY DECOR & put the finishing touch on with our AMAZING Exclusive Personalized Printables AVAILABLE NOW IN OUR SHOP HERE! For this post, I had the AMAZING talents of my newest member to the Soiree Event Design team, Katie Driver! This girl is TALENTED! She and I came up with some fabulous decor ideas and then she went to town creating these awesome DIY projects for the party taking ordinary items and making them EXTRAORDINARY! Super easy that even I can do them! All week we’ll show you how to create these fabulous Teenage Mutant Ninja Turtle Party Decorations! 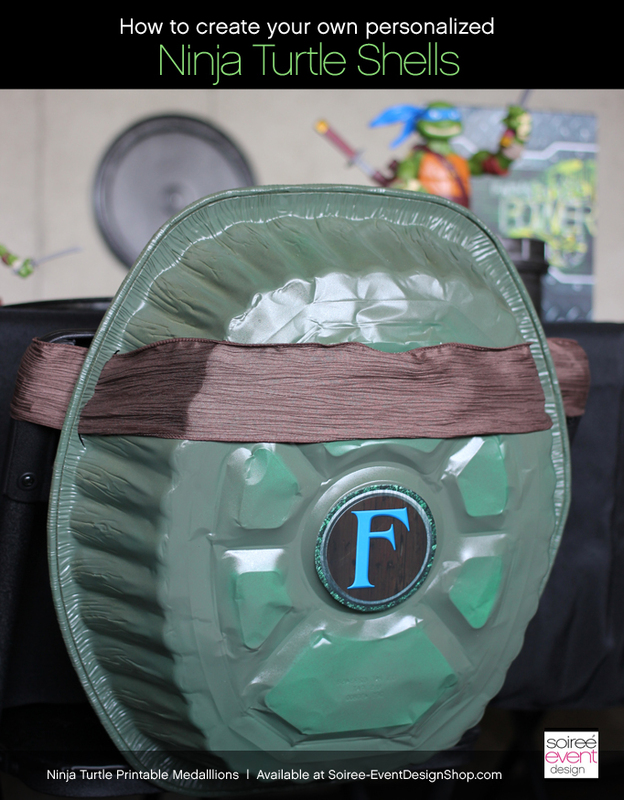 CLICK HERE TO SEE THE NINJA TURTLE PARTY with party details including the dining table with turtle shell chairbacks! 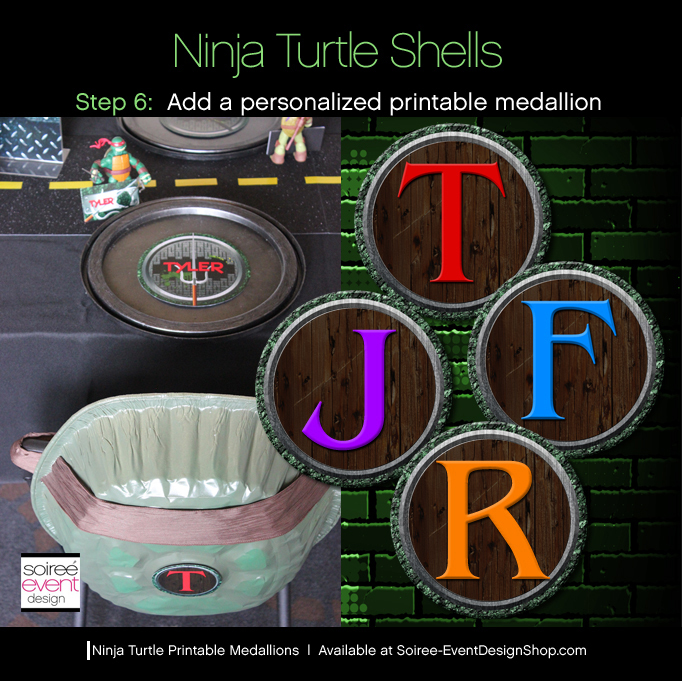 Today…it’s all about the iconic TMNT TURTLE SHELLS! CREATE TURTLE SHELL CHAIRBACK DECOR OUT OF TIN PANS! GIRLFRIEND TIP: Dollar store tin roasting pans are perfect for this project! Wipe metal clean of any residue or dust. To give the basting pan a round shape, begin by gently pulling on the sides and working the pan into an oval/circular shape. Now that you have a round shell, add volume to the shell by pushing out the indentations of the original pan. Hide creases of original pan by pushing the metal material out towards the front of the shell. This is the finessing stage and is done to your liking. 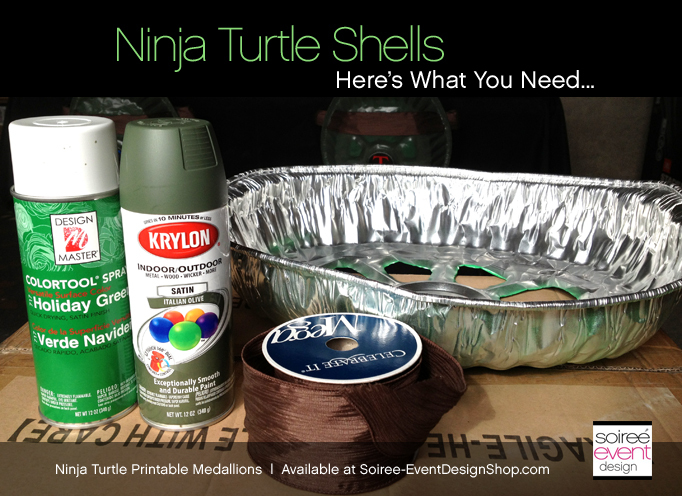 For an easy application of the highlight on the turtle shells you will need to create a stencil. Buy one extra roasting pan and dedicate the pan to your stencil tool. Using a utility knife or X-acto, cut out the convex sections. 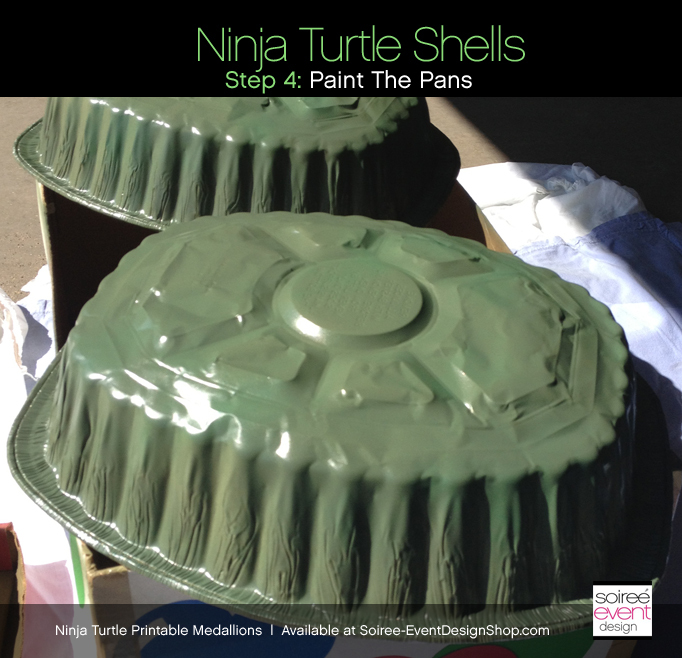 Begin painting the metal shells with the darker green spray paint. This will give the shell that all-over color. GIRLFRIEND TIP: When painting metal, light, thin coats are best. This will result in an even coat with no runs. Make sure to hold the spray can 8”-12” away from the metal and build layers as they dry. Once base layer is dry, take your homemade stencil and set on top of painted shell. 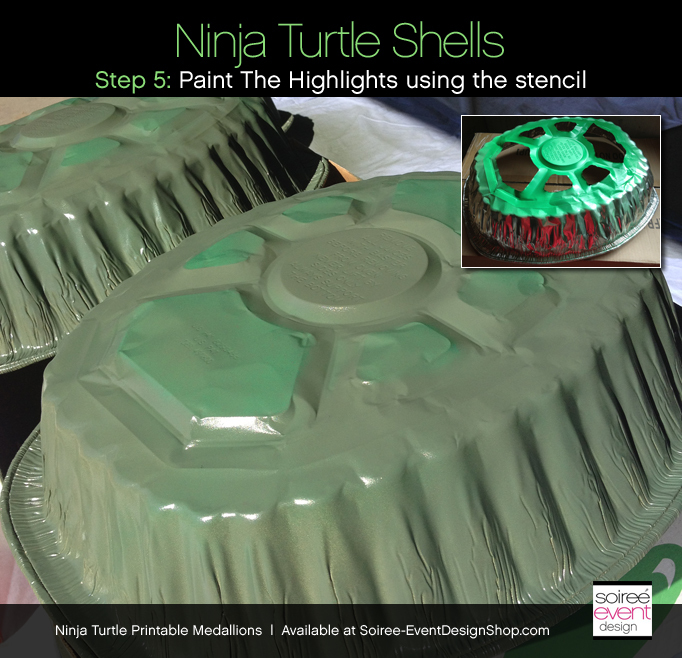 Using the lighter green spray pain, lightly paint the tops to highlight the turtle shell sections. Finish the shell by adding brown ribbon by cutting two slits on each side of the shell near the edge, wind the ribbon through it on both sides. The finishing touch? Adhere a personalized graphic medallion printable to the center circle. We created each medallion with the first initial of each guest and used the color that matched their turle place setting! GIRLFRIEND TIP: Tie each shell on to the backs of each guest’s chair for added table decor AND the guests can wear them later! DOUBLE DUTY! GOTTA LOVE IT! 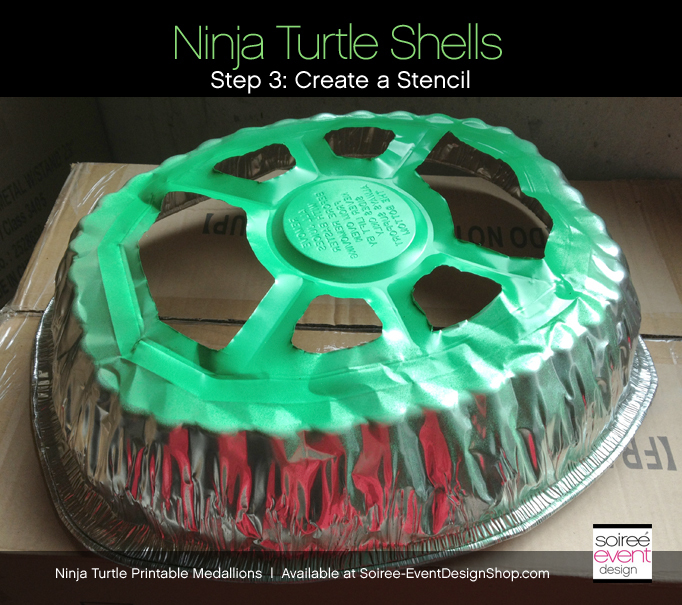 I hope this idea has inspired you to create you own Teenage Mutant Ninja Turtle party decorations! 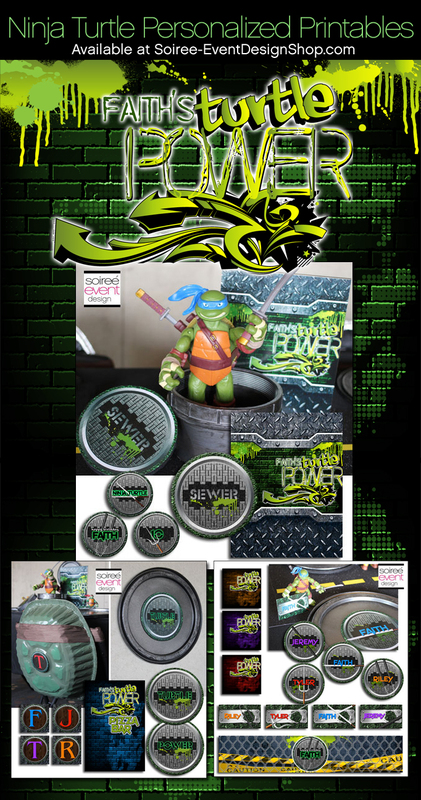 Check back tomorrow where we show you how to make our TMNT Sewer Pipe & Manhole Cover Centerpiece! Want to see more of our TMNT party pics…click here! Want to get more of my tips? Be sure to SUBSCRIBE to my blog so you can get all my blog posts delivered right to your email’s inbox so you won’t miss a thing! Subscribing is easy! Just enter your email address in the above right corner of this page and be sure to confirm your email once you get our confirmation to your inbox! That’s it!